5773…and a bit of kveching! 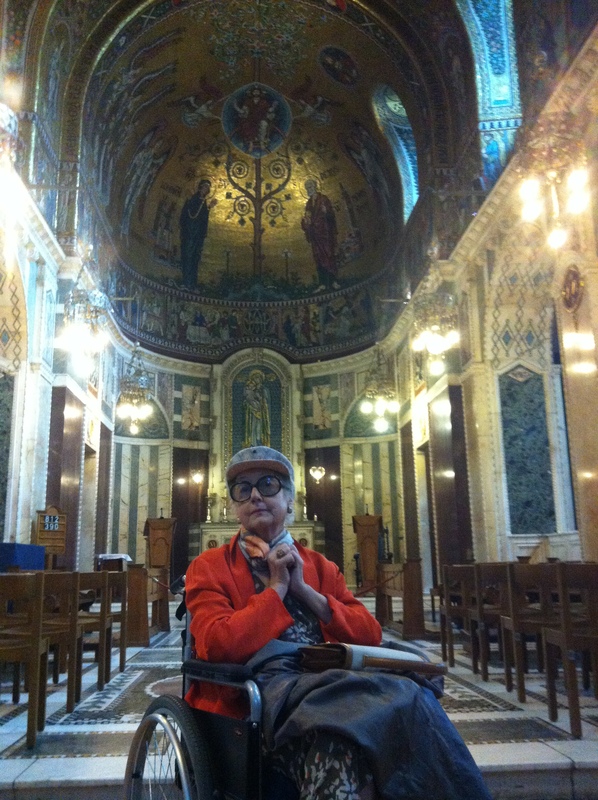 who is a devout Catholic and who needs all the prayers in the world as her health is more than shaky! Let me thus share her lovely card and from the bottom of my heart wish ever word of it to become true to her and to you, whether you are a believer or not, a Jew or a Gentile, beyond anything that may make us different, because essentially, we are alike as Shakespeare via Shylock demonstrated out a long time ago ..We are interdependent and transnational and very alive! This being said and proclaimed, I admit I have all reasons to believe that we’d better roll our sleeves and start putting into practice our beautiful principles. Somehow, I’m not sure we are….we are confronted with a world economic and political crisis of immense dimensions which is about to hit us hard (has already hit quite a few among us) and we seem to be lacking the moral values of interdependence to reach out and contribute. Despite Bibi Netanyahu’s assertions at the UN, instead of doing the talking, Mayors of the World might be doing the acting, to quote Ben Barber at the recent IDDAY 2012: “States are defined by what keeps them apart. It’s not the States but the city doing the heavy lifting. At the Copenhagen Summit, States failed, but Mayors from all over the world gathered by the Mayor of Copenhagen set to work. It was a city-to-city intelligence gathering.” (Barber, B. (2012). 10th Interdependence Day: Culture, Justice and the Arts in the Age of Interdependence. Los Angeles.). I have had the great pleasure of meeting Mr. Michael Biton, Mayor of Yeruham in the Negev, whose closest neighbours are the Bedouins and he certainly meets Barber’s standards! 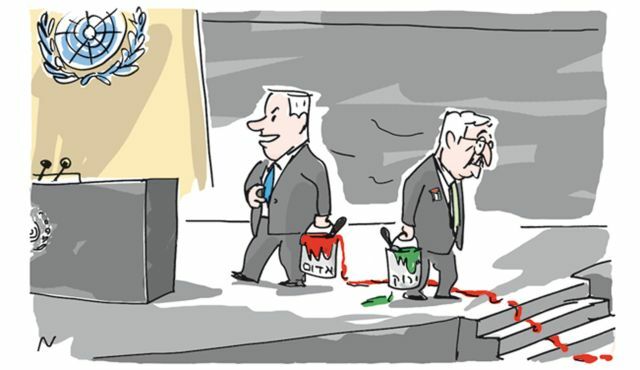 An hour before Prime Minister Benjamin Netanyahu drew a red line for Iran at the UN General Assembly, Palestinian Authority President Mahmoud Abbas re-drew the Green Line for him. The Green Line, Abbas told the assembly, is his people’s red line for negotiating any peace agreement with Israel. Abbas extolled the Arab peace initiative and said it has recently won the blessing of the “non-aligned” states and the Organization of Islamic States. This time too, the historic initiative offering Israel peace and diplomatic relations with all the Arab and Islamic states (Iran has not objected ), passed over Netanyahu’s head. In September 1993 I watched Abbas as he blithely signed the Declaration of Principles (the Oslo Accord ) on the White House lawn. (…)In his speech last night, Netanyahu almost completely ignored the conflict, the occupation and the long-comatose negotiations. They did not merit his attention. He is dealing with Hitler’s heir, who has decided to wipe Israel off the map. (…)Netanyahu theatrically provided journalists with their headline – Bibi warns that by next summer Iran will reach the red line. Abbas made do with warning that the two-state solution was running out of time and the Palestinian Authority was growing weaker. If you put the two warnings together, the result could be that when Iran completes its nuclear program, Israel will have to complete its plan to take over the West Bank again. For decades Netanyahu has ridden on Arab terrorism. He did so with great talent, all the way to the prime minister’s seat. Now that terror against Israelis is at an ebb – especially due to the excellent coordination with the Palestinian security forces – the terror card, along with the incitement card, have changed hands. The leader of a nation with no state presented dry figures – 535 attacks by Israelis against Palestinians since his speech from the same podium; 510 Palestinian buildings destroyed, leaving 770 people without a roof over their heads. He built his “case” on international law and on UN reports. He based his tactic on American politics. The request to be accepted as a UN member state will wait for November 6, U.S. election day. Some say (the Americans have not confirmed this) that Obama has promised Abbas mountains in exchange for this great favor. The reward the Palestinians think they deserve is a U.S. vote in their favor in the General Assembly, or at least an abstention. But they’re not holding their breath. And indeed, it’s high time for Israeli and Palestinians, to come to terms with the curving of their dreams and face the reality of living together maybe…As Dani Cohn-Bendit reminded the Basel Casino on the celebration of the 115th anniversary of the very first Sionist Congress. Here’s a reminder (thanks to Wikipedia!) of what happened then: “ Le Premier congrès sioniste se réunit à Bâle en Suisse, du 29 au 31 août 1897, et marque le tournant décisif dans l’histoire du mouvement des Amants de Sion, qui devient officiellement mouvement « sioniste-politique ». Herzl y propose son programme, qu’il qualifie de « plan de réunification nationale juive ». (…). Dans son journal, Herzl écrit : « Si je devais résumer le Congrès de Bâle en un mot, ce serait celui-ci: à Bâle j’ai fondé l’Etat Juif (…). Peut-être dans cinq ans et certainement dans cinquante ans, chacun le saura. » Source: A. GRESH, Israël, Palestine: vérités sur le conflit, Fayard, 2007. p72. Talking about green lines, I am extremely grateful to Marko Weinberger, President of JCall Switzerland (click on the link for more on JCall or enter JCall in my search engine) and the most optimistic guy on this planet, for forwarding me this paper as I searched in vain for any celebration of this 1st Congress…OK 115 years may not be the round number for such celebrations, but I’m glad that the New Israeli Fund gathered an overcrowded audience made of people who in larger numbers everyday, urge Israel and Palestinians to come to terms with political, demographical and democratical realities. Fast auf den Tag genau 115 Jahre nach dem ersten Zionistenkongress stand das Stadtcasino Basel erneut im Zeichen des Nahen Ostens. Das Keranliengen des NIF (New Israel Fund) sei das Existenzrecht Israels, aber auch die “kompromisslose Einhaltung der Demokratie” auf der Basis der jüdishen Werte und der Unabhängigkeitserkrärung. (…)Es gebe keinen Konflikt, den man nicht lösen könne -man müsse es nur wollen. In Abelin, P. (2012). Daniel Cohn-Bendit in Basel: “Israeli und Palästinenser müssen ihre Traüme begrenzen! Tacheles. Zürich. Right now, to my dismay and to yours most probably, Israel found it timely to dismantle a Bedouin settlement in order to create space for a jewish religious settlement.…I’d like to thank my colleague Uri Horesh who isn’t only a fine sociolinguist but also a vibrant human rights activist for sharing with me the link regarding the Negev Coexistence Forum for Civil Equality. Internet is such a wonderful yet overwhelming tool, we get so many links that several lives wouldn’t suffice to follow and identify good leads, so, my gratitude goes to all my reliable friends and colleagues such as the members of both of my FB groups, Sociolinguists on Facebook and Academie Sans Frontières, for alerting us for worthwhile causes of concern. Thanks also to Marilyn Mehlman, a member of ASF for alerting me on the dismantling also of an academic department via the petition lauched by Israeli Academics under threat of the closing down of their political science department. To quote Uri Horesh who kindly enlightened me: “the very reason the department is being closed in the first place (or one of the main reasons, at least) is the objection of the powers that be to the vocal support from within that department of the BDS movement and the scholarly work that has been done there over the years which is contrary to the mainstream Zionist narrative.” So long for Israel’s stand on its democratic spirit I guess…. 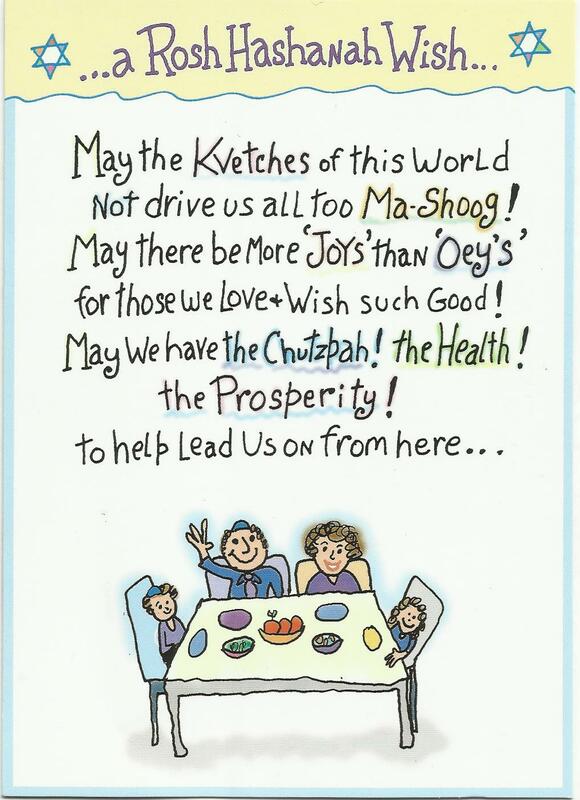 Honestly, what more will it take for all of us to stop kvetching and to start acting as Mentsh…as I’d hate calling you a Schmuck which would be a very bad start for a New Year, so I eagerly await your comments I’d be too happy to publish as long as they are expressed in decent mentshliche terms. Freedom of expression is otherwise your right my dear Cosmopolitan friends and colleagues! (1)Oct.1st, 2012 update. It is my sad duty to complement this paper as our dear Alexandra alas passed away a mere couple of days following this post. May she rest in peace after such a harsh combat. She believed in God and Paradise. I’m sure she’s right now giving some more love and education…as well as sharing a well deserved Pim’s cocktail to her fellow angels. Previous PostA quand un Luther musulman? Kamel DAOUD, Raoudha KAMMOUN et TOUS LES AUTRES! chère Daphné, j’ai été très émue à la lecture de ta dernière cuvée ; dire que pour toi l’amitié n’est pas un vain mot est encore peu dire… et merci de nous faire partager tes lectures et commentaires ; oui, soyons mentsh, et tentons de ne pas être fatalistes mais agitons-nous, alertons, alertons intelligemment avec la conviction que ça peut faire bouger les lignes…. vertes : à ce propos, écoutez ou podcastez la très jolie émission de ce matin “Concordance des temps” par Jean-Noël Jeanneney intitulée “le vert les langages d’une couleur, invité Michel Pastoureau au sujet de la sortie de son livre Vert: histoire d’une couleur qui paraîtra en mars 2013 : http://www.franceculture.fr/emission-concordance-des-temps-le-vert-les-langages-d-une-couleur-2012-09-29 (je suis fière d’être ton amie).